American Express was named BizBash's Top Innovative Brand, with its Coachella, Panorama, Golden State Warriors, Seattle Seahawks and Platinum Card experiences all cited as examples of the brand's excellence. To celebrate the second year of its partnership with the Seattle Seahawks and to get the team's fans—also known as 12s—pumped for the upcoming season, American Express hosted a seated dinner for card members on CenturyLink Field's 50-yard line. “Dinner on the 50,” which took place August 27 and was produced by Momentum Worldwide, offered guests a four-course meal inspired by four quarters of a football game. According to an event spokesperson, “a few hundred people” were at the dinner. The American Express partnership with the Seattle Seahawks, which launched in late September with the team’s first home game against the Chicago Bears, is a case study in how to score with retailers, sports fans and consumers. With partnerships in place with pro basketball and hockey teams, as well as its tennis and golf sponsorships, the financial services giant is no newcomer to sports, but the Seahawks is the first NFL team to join the American Express portfolio. As brands continue to experiment with virtual-reality technologies, the consumer experience has only become more and more active. That's especially great for sports fans who want to experience what it's like to face off against their favorite athletes, and it's exactly what American Express did for this year's U.S. Open. How hard is it to return a 100 mph serve? Fans attending the US Open, which begins in two weeks, will get a chance to do exactly that -- off the racket of Maria Sharapova. 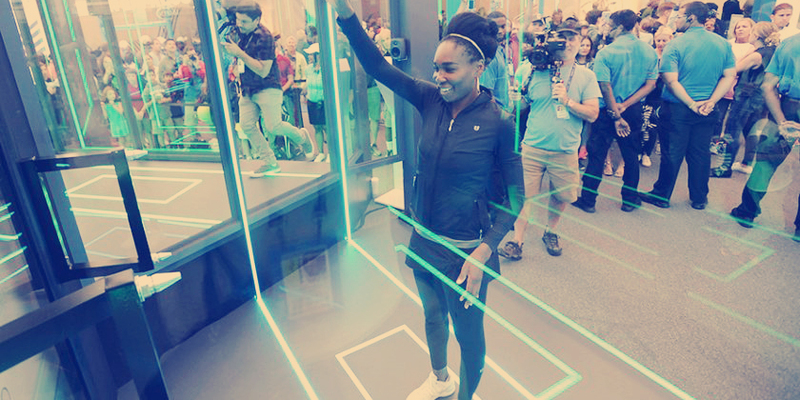 As part of a fan experience station on the grounds of the USTA Billie Jean King National Tennis Center, American Express commissioned the services of its newest spokesperson, who spent nine hours in a virtual reality studio in California to pull off the promotion. American Express is partnering with Ms. Sharapova for a virtual reality game that lets U.S. Open fans return the tennis legend’s serves with their own moves, the latest example of a marketer embracing new technologies to create immersive experiences for consumers. The “You Vs. Sharapova” game is just one element of American Express’s broader marketing efforts around the tennis tournament, which the company has sponsored for more than 20 years.